Winning Entry This drawing by Erin Forgit, a 9th grader at Warhill High School in Williamsburg, took first prize in the Artwork Contest for Marine Science Day 2012 at the Virginia Institute of Marine Science. 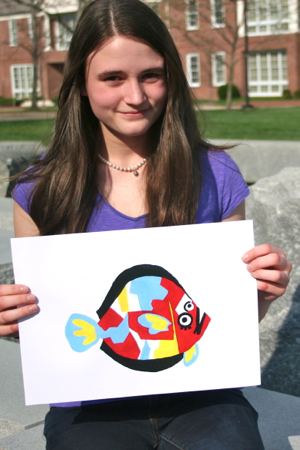 Erin Forgit, a 9th grader at Warhill High School in Williamsburg, was awarded first place in the Virginia Institute of Marine Science’s annual Marine Science Day artwork contest for her colorful drawing of a flounder. Forgit’s winning entry was one of dozens of pieces of flounder art submitted by children and adults from throughout Tidewater Virginia. It becomes the official design for this year’s edition of Marine Science Day at VIMS, which takes place on May 19. Forgit’s entry will be used in publications, advertisements, and on the 2012 Marine Science Day T-shirt. Forgit, who earned an honorable mention in last year’s Marine Science Day artwork contest, is a self-professed nature lover with a life-long interest in biology and marine science. She says she took inspiration for this year’s winning entry from the works of Pablo Picasso. For her efforts, Forgit will receive a framed print of the final artwork and one of the T-shirts printed with her drawing. The gifts will be presented in a brief awards ceremony during Marine Science Day. Contest organizer Susan Maples, public outreach coordinator at VIMS, says the friendly competition provides local artists with an opportunity to display their talents while also supporting VIMS and its mission of restoring and enhancing Chesapeake Bay and its marine life. “We had a number of engaging works to chose from again this year,” says Maples. “Erin’s entry stood apart for its creativity and bold use of color.” Judging was based on originality, fit with the Marine Science Day theme, and suitability for use on a T-shirt. VIMS honors a different animal or environmental feature each year during Marine Science Day. In addition to this year’s choice of a flounder, past selections were a seahorse (2011), sand (2010), scallops (2009), a penguin (2008), a sturgeon (2007), plankton (2006), a shark (2005), a sea turtle (2004), and a blue crab (2003).